I think that zucchini is my all time favorite vegetable. I am always trying out new things with zucchini. The market had a huge sale going on for the vegetable so I purchased quite a bit not realizing that I had too much. 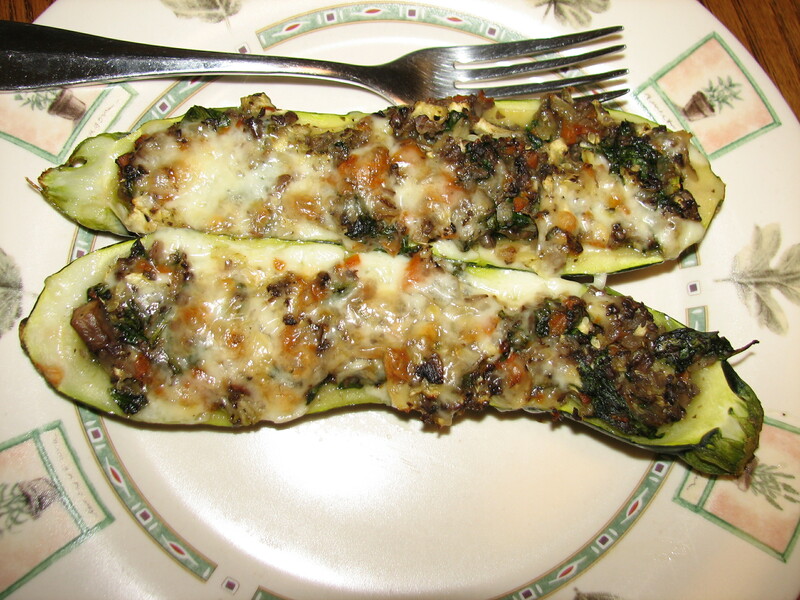 I had different veggies in the refrigerator so I decided to make a vegetable stuffing and made stuffed zucchini boats. Loved the concept. Loaded with flavor, little bit of prep work but worth it. Enjoy! Preheat the oven to 350 degrees. Cut the zucchini in half and scoop out the centers with a spoon. Lay the halves on a cookie tray. Clean and chop fine all the vegetables except for the spinach. Just roughly chop the spinach because the cooking the spinach will wilt it quite a bit. In a large pan, heat up the mushroom broth over medium high heat and add the mushrooms, onions, carrots and cook for a good 5 minutes until the mushrooms and onions develop a deep brown color. Add the zucchini meat that was scooped out from the centers, coarsely chopped and then add the spinach and saute for a few minutes until the spinach wilts and the zucchini is incorporated in the stuffing. Stuff the halved zucchini with the cooked vegetables. Sprinkle with shredded Fontina cheese and bake for about 30 minutes until the boats are semi soft and if you used cheese the cheese has melted and browned on top. I am always trying to find decent vegetarian burger recipes for me to eat. My biggest frustration is keeping the patties together when I am cooking them. 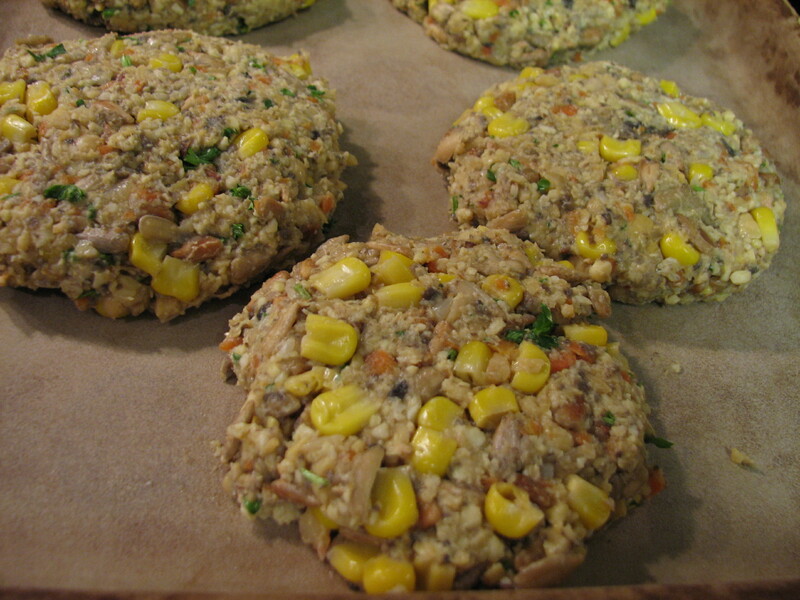 I found that the best way for me to cook veggie burgers is to put them on my stone and bake or broil them in the oven. This is less stress on the patty so there is no breakage. Veggie burgers usually come in all shapes and forms. I decided to make my own version and absolutely fell in love with it. What great flavor and so healthy for me. I just added things that I liked in a veggie burger and just kept adding till I achieved the flavors I wanted. 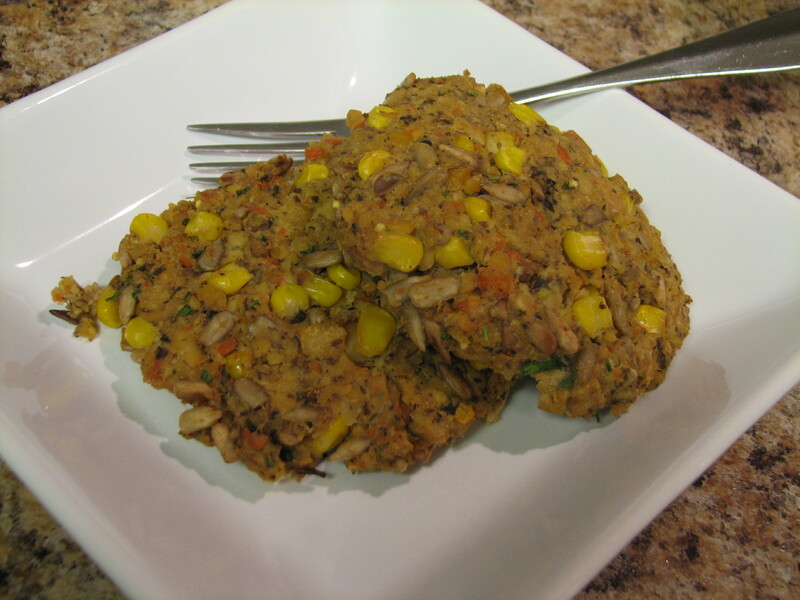 Actually after adding all the ingredients, I couldn’t stop eating the veggie burger mixture. I think I hit it right on my taste buds! Adorn with your favorite things like pickles, lettuce, tomatoes, whole grain buns, caramelized onions, and mustard – whatever floats your boat. I think next time I might make Tahini dressing to go with this. Enjoy! Preheat oven to 400 degrees. Prepare the vegetables; mince the mushrooms, onions, carrots, and garlic with a food chopper or with a knife. In a 10” sauté pan, heat up the olive oil over medium high heat. Add the vegetables, season with salt and pepper and sauté for a good 5 to 8 minutes until the carrots are sort of soft (not mushy). Remove from the heat. In a food processor, pulsate the Tempeh and garbanzo beans until coarsely ground. Add the sautéed vegetables and pulsate a few times till mixture is blended. In the sauté pan, add the corn and sauté for about 3 minutes until the corn is cooked through, season with salt and pepper. In a glass bowl, empty the food processor bowl with the mixture into the glass bowl and mix in the corn. In the same sauté pan, toast the sunflower seeds until the color is a rich brown. 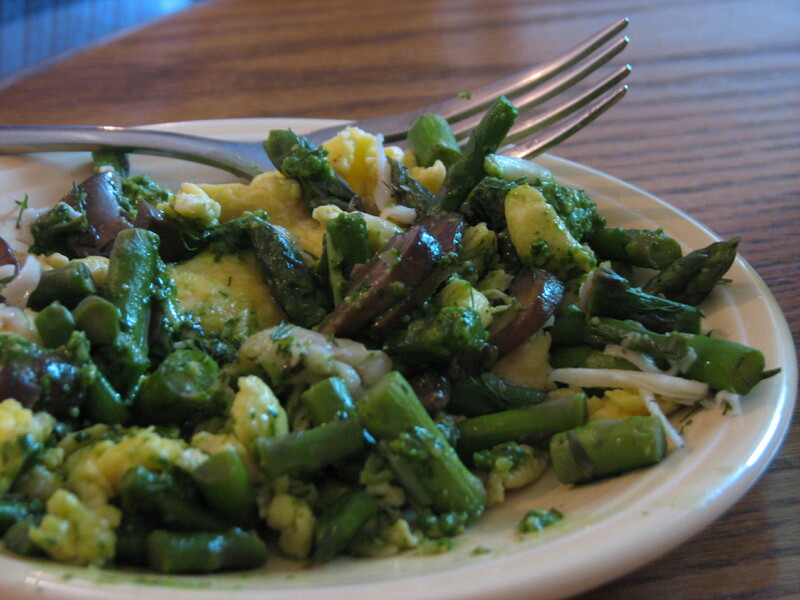 Add the toasted sunflower seeds, minced parsley, egg substitute, and soy sauce combine well. This makes about 8 to 9 patties. I formed the patties and placed them on the stoneware. Very lightly sprinkle olive oil over the patties so they do not dry out. Bake at 400 degrees for about 30 minutes until lightly browned and heated thoroughly. I went to a different farmer’s market on Saturday in downtown Columbus, Ohio at the North Market entrance. What was so nice about this market was that it was a little bit cheaper than the one I frequent weekly in Worthington near my home and it is easier on my food budget. I picked up a bunch of tomatoes and zucchini without any idea of what I was going to make. I came home and saw a recipe on one of my favorite food blogs and thought hmmm, let’s try this. 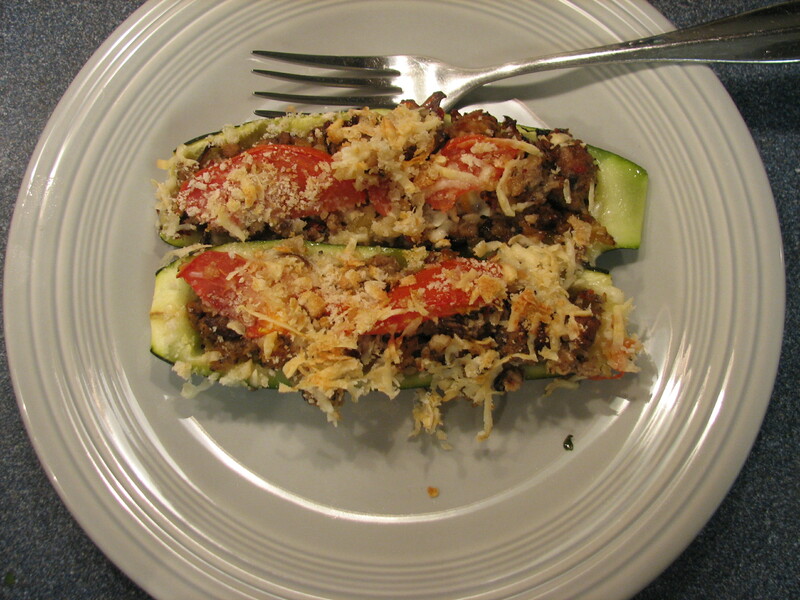 Stuffed zucchini with tomato basil chicken sausage, onions and mushrooms topped with fresh tomatoes and homemade bread crumbs mixed with freshly grated asiago cheese. The recipe came out and it was fresh, green, healthy, and satisfying. Could not have asked for anything more. In a large pan, heat up the olive oil over medium high heat. Add the chopped onions and mushrooms and cook for about 5 minutes until the onions are soft and the mushrooms are semi soft. Take the sausage out of its casing and crumble the meat into the pan of onions and mushrooms. Add the garlic and cook until the sausage is done. Put about a quarter of the French baguette in a good processor and pulse until the bread resembles bread crumbs. Add ½ cup of the bread crumbs into the meat mixture and the bread crumbs will absorb the rest of the liquid produced from the meat mixture which is fine. Remove from the heat. 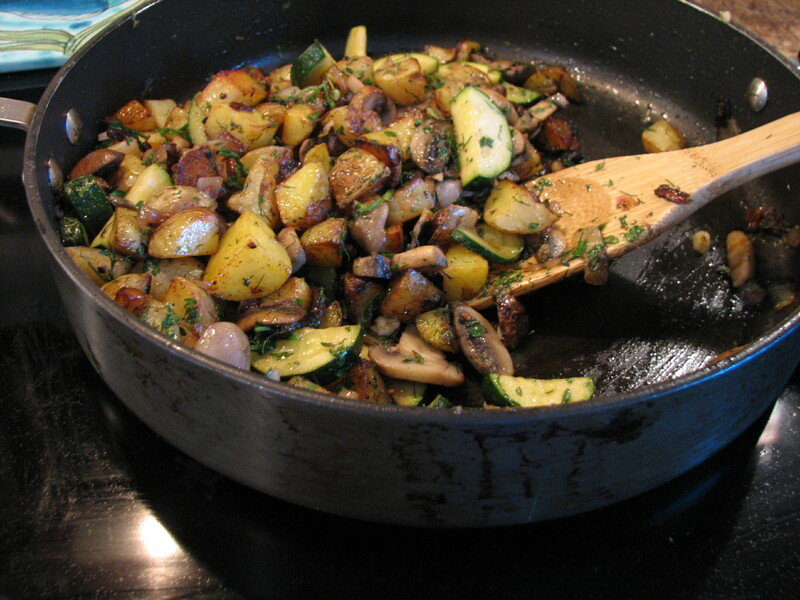 Put the halved zucchini in a 9 x 13 pan and stuff with approximately 3 to 4 tablespoons of the meat mixture. You will probably have some meat mixture left over – which can be saved for another recipe. Add the sliced tomato on top about 2 halved slices per zucchini or more if you want and then sprinkle with the rest of the bread crumbs mixed with Asiago cheese. Bake at 350 degrees for about 45 minutes, serve hot. Enjoy! Local fresh farmer market ingredients what can I say? 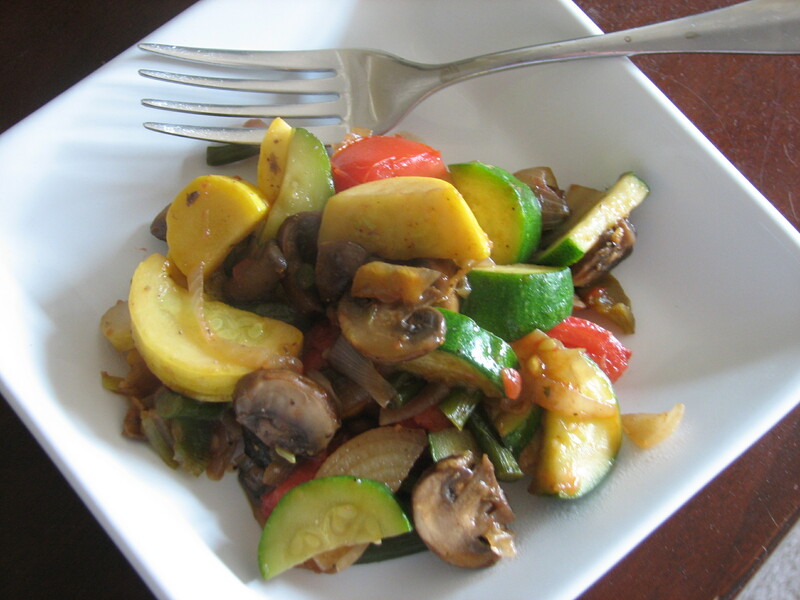 Summer squash, zucchini, spring onions, mushrooms oh my. All of my most-favorite things to eat. I made a simple stir-fry to go with my Red Potato, Onion and Tomato Gratin. Fresh vegetables sautéed lightly with a little olive oil, salt and pepper, I couldn’t have asked for a simpler dish than this. Enjoy! In large sauté pan, add about 2 tablespoons of olive oil over medium high heat. Sauté the onions, garlic fronds and mushrooms for about 5 to 7 minutes. Add the summer squash and zucchini and sauté for about 5 minutes until the vegetables are hot but still crisp to taste. Remove from heat and add the chopped tomatoes and stir until tomatoes are warm. Season with salt and pepper. Serve hot.